This is the written pattern for the Totoro and his brown sack, the tiny White Totoro and the Soot Sprites that I designed for the Catbus. The bus is already a free pattern and it comes with a video tutorial right here. Here is the video tutorial for the Blue Totoro. information just before the pattern. Read me ~> Work in continuous rounds, do not join. Add in a marker at the end of row 2 and move that marker at the end of every row. .
For this project I sewed the ears onto the head while I was still crocheting the body. I found that the easiest way. But they can certainly be sewed in place after the body has been stuffed and closed. To make it the way I found easiest then you will make the ears before you make the body. Eyes are 2 round pieces of white felt that I glued to the head on the 4th and 5th row using tacky glue. I dotted in the black pupils with black acrylic craft paint. I did this step after the doll was stuffed and closed. The nose was whip stitched into place centered just below the eyes after the doll was stuffed and closed but you can also do this step as you are still making the doll. This pattern is for the Blue Totoro. If you would like to make one like the one pictured above then follow along the exact same pattern but hold 2 strands of worsted weight yarn together and use a 5mm hook. Instead of white for the tummy I used an off white color. I also brushed out the grey one with a steel pet brush to get him fluffy looking. Tie in some black embroidery thread for the whiskers then rub them with glue to keep them from fraying. sl st next st and f/o leaving a long tail for sewing. Before sewing the tummy patch to the body add in the little tummy markings with the same color you use for the body.The top of the patch should be on or above the 7th row (you can adjust of course if it looks better a little higher or lower. f/o leave a tail for sewing. Do not stuff arms. Sew them in place after the tummy patch is sewn on. I put mine on a slant with the top corner in line with the top of the tummy patch. You can of course sew them straight, whatever you feel looks the best. 19) 2tog twice and f/o leave a tail for closing up the gap. Weave in and out of the remaining st, pull to close gap and knot off. Hide yarn tail inside body. Again I found it easier to sew the ears in place before closing up the body. So the pattern starts with the ears first. The eyes are done the exact same way as the Totoro above but are placed on the 3rd and 4th row. sl st next and finish off. Hide yarn tail inside sack then stuff the sack leaving the last 3rows unstuffed. chain 12 and f/o. Weave one yarn tail in and out of row 7. Pull tight to close the sack and seal the stuffing inside. Knot off. Using your yarn needle carry the yarn tail through the sack and out. Bring the other yarn tail into the sack through row 7 about 2st over from where the first yarn tail entered. Knot off and bring it down into the sack and out. Cut both yarn tails free. I happened across your site yesterday, after plugging in youtube, looking for a crotcheted stuffed toy. LOVE your animals. Oh my gosh, you are so talented! I made one yesterday, first time ever. I have enjoyed crotcheting afghans, and various other baby items but I have never even attempted a stuffed toy. I know he's not perfect, but just the same I like him :) I look forward to trying others. I know I will only get better! Thanks so much for taking the time to post everything. Have a craft filled day!! Hi Sharon, when you brush the your Amigurumi toys is it possible to use just ordinary worsted yarn or do you use a fancy yarn? I don't want to wreck one that I have finished. Hi Sharon, loving ur patterns at the moment ! Just finished the bear and now doing Totoro! My lovely husband is asking for a cathulu teddy along with his friends! Just wondering if u know of any patterns? is there anyway you can do nightmare before Christmas patterns? I love how easy your patterns are to follow and I'm new to crocheting and I was hoping I could make some nightmare before Christmas things. 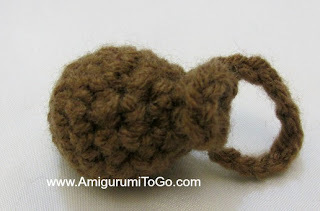 This pattern is amazing, but I have a question regarding the crochet hook sizes I use, since I'm completely new to arigurumi. Looks like you've used a yarn that's originally for crochet hook size 5.5mm, but you've used 3.75mm hook, and I understand why. However, what if I want to use a DK yarn instead? What size hook would I use then? I've never worked with DK yarn but a 3mm should work fine, I believe DK yarn is quite thinner than what I've used in this pattern so maybe even a smaller hook? But honestly if you crochet more on the tight side like I do then a bigger hook will work too. I give hook sizes but that's only if you want the exact size of amigurumi you see in my photos. If you crochet more on the loose side then a bigger hook will cause gaps in your stitches so try a couple rounds and see what hook will work best. Feel free to change the hook size to what works for you. I love this pattern. This was my very first attempt at amigurumi and I found your instructions very easy to follow. I love making these guys! I do however have a question, how big is the medium totoro? Ive usually used "I love this yarn" for projects, so I was surprised by how small he came out! (~3.5") I then used a yarn called "lion brand jiffy" given to me by a fellow crochet user and he came out a good size bigger. Currently making a doubled up yarn totoro for a friends bday, he'll love it! Hi Sharon! I love you tutorials and stuffed animals. 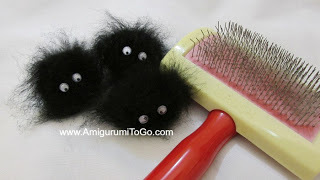 I am trying to make this toy but the only crochet hook size i have is a 6.5mm crochet hook. Is that ok to use? that is very large hook. If you're using a medium weight yarn you will have to hold 2 or 3 strands together for it to work, otherwise you will have gaps in your stitches. 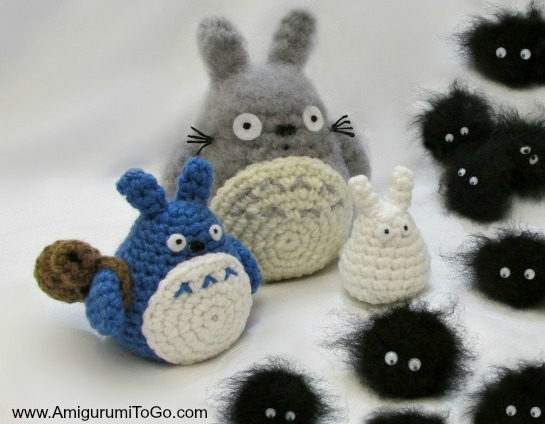 It would also work if you have a bulky or chunky yarn, then you will have a larger Totoro. I talk about holding yarns together here Easy Way To Enlarge Amigurumi Depending also how tight you crochet, you could use up to a 5mm maximum for one strand of yarn. I would suggest getting smaller hooks, like a 3.75mm, a 4mm and a 4.5mm to play around with and see which one works best for you. Thanks so much for your patterns! My first grandchild is due in July and the nursery theme is Totoro. I am crocheting multiple Totoro in different colors for a mobile. We plan to use soot sprites as well. Any suggestions on a pattern for leaves/raindrops? Hi! What "sl"means? Tahnk you!